I asked several of my new friends and my cousin in California to share their responses after participating in PRIDE last Sunday. If you didn't get to go, their responses will give you a glimpse into what we experienced. I hope you will take the time to read these. It brought me to tears cutting and pasting their experiences. I don't need to add anything, but too was overwhelmed with the love of complete strangers, not just in the Mormon groups, but more especially from those cheering for us. As one marcher said, "It's embarrassing, when all we are doing is walking to receive so much love..."
Cindy shared this: Last year I told my son I was coming to the Pride parade. He seemed surprised and a bit nervous and felt it necessary to warn me it wouldn't be like the small town parades I was accustomed to....I wasn't too worried. Our whole family, grandkids and all went and loved being there to support our son and his friends as well as the entire LGBT community. Mid parade the buzz of clapping hands and cheering voices escalated and I was surprised and humbled to see the Mormons Building Bridges group confidently striding up the road. It immediately brought tears to my eyes and I knew I wanted to join in the 2014 Pride parade marching alongside the members of this group. My daughter-in-law and her kids joined me for this incredible experience and we all loved it! Our purpose in marching was to show our love and support, but in the end we became the recipients of the exact gift we sought to deliver. High fives, hugs and thank you's were abundant and sincere, but nothing could have been better than hugging my handsome, smiling son cheering from the road-side surrounded by his friends and other family members. My son has always known our love is unconditional. It's such an easy but powerful thing to do to show how much we wholeheartedly support him. This experience will never be forgotten and I hope to do it over and over again!! Carolyn sent me this absolutely beautiful and visual poem to express her feelings. Down the street in the center of Salt Lake City. Mixed in with a little Salvador Dali, but without the melting clocks. You would have liked it, I am almost sure. A carnival? Yes, of communion and common cause. But this was not a freak show. There are no freaks, no outsiders, no rejects, no misfits. And chose to run away with the circus for a day. "This was my first Gay Pride Parade. I began the march to show my support to the GLBT community. I ended the march feeling overwhelming love and acceptance from them. Before the parade actually started, I saw many of my 'rock stars' -- people whose faces I have only seen images of on Facebook, and whose FB posts have positively impacted me-- wandering through the MBB crowd. It was surreal. I was not shy, however, in introducing myself to them. Each one graciously shook my hand and gave me a hug. I met my sister's husband's brother there, who is gay. I had never met him before, but recognized him from his Facebook picture. He was so happy to know there's an ally in the family and expressed hope that someday his family would try to reach out to him. Once the parade started, I was not prepared for the overwhelming humility that engulfed me as we were greeted by cheering, applause, and tears. I feel peace because of my participation"
Why I marched in the pride parade? I’m not sure if words can adequately explain why I was compelled to march this year in the pride parade. As a faithful LDS mother, there are reasons why I haven’t marched up to this point. 1) It's on Sunday, I typically spend the day with my family refraining from activities that could be done on Saturday. 2) Let’s just say I have seen pictures of the parade and knew I probably wouldn’t be comfortable taking my children to it, so why would I go? That said, this year I was compelled to go, so much so, that I had to convince my daughter that it would be good thing to break the Sabbath and expose ourselves to sights that we weren't used to seeing for a few reasons 1) My wonderful gay son is graduating with a double masters this week. This kid is AMAZING! I want to shout that to the world and celebrate with people that get how wonderful these kids are. In the church, it doesn’t really seem to matter how amazing these kids are, if they are gay, that is somehow bigger than any other accomplishment or incredible divine gift they possess. 2) I want the lgbt community to know that I see them and they are worthy of love, especially God’s love. In the church, I sometimes feel like we are the Priests and Levites that refuse to see the suffering that our doctrine causes in individuals trying to navigate between what their heart is telling them and what their church is telling them. We can do much better! 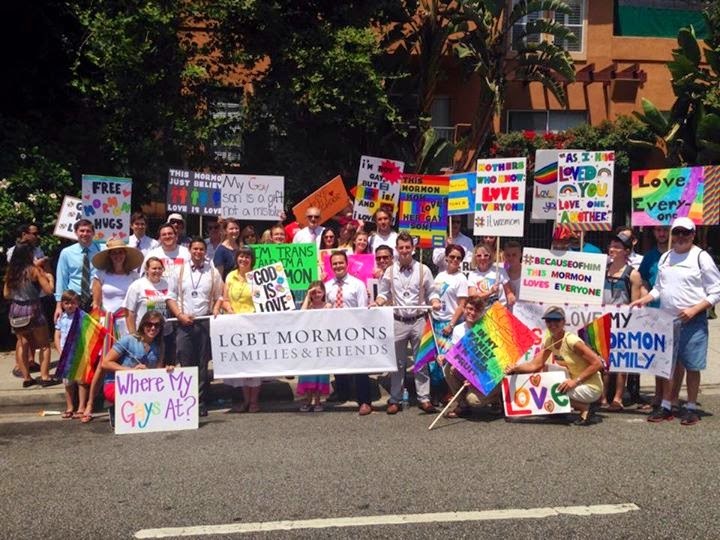 3) If my son can sit through four hours of conference and choose not to be offended because he loves and respects his Mormon family, I can attend a gay pride parade, because I love and respect my son and want him to know it. 4) Affirmation is a wonderful group doing a great service and I want to show my support for them. So, how was my first experience at pride? We had a great day! My daughter and son marched with me. It was wonderful to see how happy (and surprised) my son was that we wanted to come and march with him. We met wonderful people that are putting themselves out there to make a difference, heal broken hearts and show love to all people. People cheered for us. There was a wonderful overall feeling of love and inclusion. It was a great bonding experience for our family (even the ones that weren’t there in person were happy to see us all marching together). Our hearts grew a little bigger along with our capacity to love a little more. Would I do it again? Of course, who can argue with a desire and prompting to show love to ALL God’s children? 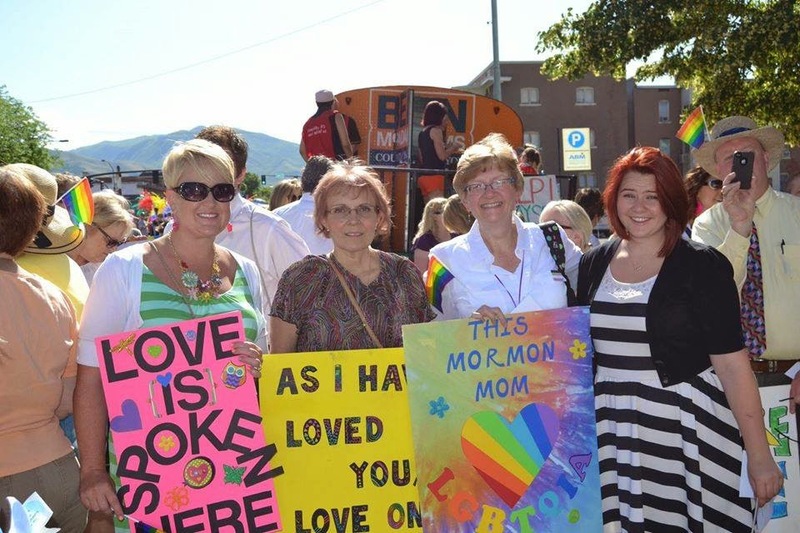 If you had told the “old” me (the Mom who didn’t yet know she had two gay daughters) that I would not only excitedly attend the Salt Lake Gay Pride Festival and walk in the parade, but that it would be one of the most truly spiritual experiences of my life, I would have thought you were completely NUTS. But that is exactly what happened. And every time I think about it, I have to find a Kleenex. First of all, before the parade started, our Mormons Building Bridges group had a LONG wait and a friend and I were sitting on the curb. I had my poster (“This Mormon Mom <3 L G B T Q I A”) and a young woman asked if she could take a picture of me with it. The gentleman who shared our curb told her he’d take a picture of us and she sat between my friend and I and we put our arms around her. She burst into tears and just sobbed, asking “Why can’t MY Mormon Mom love me?” My heart broke for her and I just wanted to take her home! And as we walked in the parade, the cheers and the “THANK YOUs” and the tears and the high-fives and the hugs filled my soul. As I looked into those beautiful faces of all varieties, I felt as if I was being given a small taste of the pure love our Lord has for every one of those souls there, and I felt the sorrow He feels for the pain and heartache our LGBTQIA family members and friends have experienced. And my already full heart almost burst with joy when my daughters emerged from the crowd to throw themselves into my arms, then their friends joined us and my heart grew again. My heart is forever changed; I feel like I gained so much by being there, and if I was able to give even one LGBTQIA person a bit of love and hope, it was truly worth every minute. I will not only be at every Pride that I can, but I am doing my best to extend that feeling out to everyone I encounter, especially gay young people.